Although the famous scientist Madame Curie was a woman, girls have not always been encouraged to study science and math. But that is changing. Expanding Your Horizons in Science and Mathematics is a program of the Math/Science Network conference held in southwest Missouri. This conference helps to encourage girls' interest in science and math and urges them to consider careers in engineering, computer science, and biology. About 200 to 500 girls attend this conference. 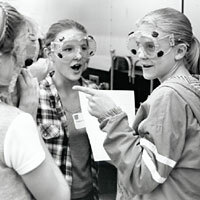 There are a variety of workshops led by women scientists, mathematicians, and engineers. Workshops include activities such as learning about light, vision, and the chemistry of colors while doing experiments. Another workshop teaches how toys work by allowing students to take some toys apart. They learn about magnets, electricity, and air pressure as they are used in toys, and they get to make their own toys to take home. Origami (the art of paper-folding) is used to teach math concepts as students fold paper into models and geometric designs. In other workshops, students learn how to make robots, how to take apart and put together computers, and how to make a Web page.